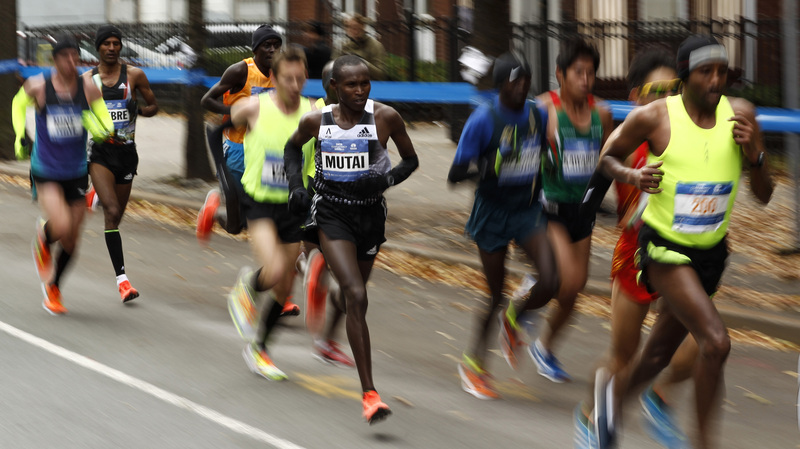 How much faster can marathon runners get? Just over a month ago, Dennis Kimetto of Kenya ran the fastest marathon ever, finishing the Berlin Marathon with a record-setting time of 2 hours, 2 minutes and 57 seconds. This means that for more than 26 miles, Kimetto kept up a blisteringly fast average pace of 4 minutes and 41 seconds per mile. On Sunday, some 50,000 people tackled the grueling 26.2-mile course of the New York City Marathon. While no one broke the record during that race, Kimetto's Berlin Marathon run is the fifth time the world record has been broken in the past decade. Yet humans keep redefining the limits of speed and endurance. Part of the reason for this is that breaking records is a lucrative business, and more people are getting access to the training resources they need to join the elite group made up of the world's top runners. Some people crave fame and fortune, said Peter Weyand, a professor of applied physiology and biomechanics at Southern Methodist University in Dallas. "That incentivizes doing whatever you can do to go faster," Weyand told Live Science. "That's why people are running faster and dogs and horses are not." But how much faster can humans possibly get? No matter how determined and talented a person is, there are some physiological limitations humans simply cannot overcome, experts say. There's disagreement over which body system functions as the ceiling for how fast humans can run, Aaron Baggish, associate director of the Cardiovascular Performance Program at Massachusetts General Hospital and co-medical director for the Boston Marathon, told Live Science. For long-distance running, the biggest limitations are cardiac output and oxygen flow. Marathoners rely on a process known as maximal oxygen uptake, which dictates how much oxygen is delivered to the muscles. A person's VO2 max is a measurement of how quickly they use oxygen during aerobic exercise, Weyand said. The faster the oxygen flow, the more aerobically fit a person is. VO2 max is measured in how many milliliters of oxygen per kilogram of body mass a person can cycle through each minute (mL/kg/min). An average healthy male has a VO2 max of 35 to 40, and the average healthy female has a VO2 max of 27 to 31. Elite male runners can have a VO2 max of around 85 and females around 77, according to research in the Journal of Applied Physiology. The key to long-distance running is finding a pace as close to VO2 max that's sustainable over several miles. It's all about pacing and managing energy expenditure, Weyand said. Sprinting has a different set of limitations. For shorter distances, it's about muscle strength, stride length and how quickly a runner can turn over his or her stride, said Jean-Benoît Morin, a professor of sports biomechanics at the University of Nice in France. But to run fast, it's important to be able to direct that force forward. Humans have an inherent disadvantage here because they only have two legs, Morin told Live Science. Humans hold their center of mass directly above their feet. This is a problem, since the force from each push off the ground is directed mostly vertically instead of horizontally. In contrast, four-legged animals, like greyhounds and cheetahs, can spread out their center of mass across four limbs instead of two. They also have much greater range of motion in their limbs and are better able to direct the force from each push in a horizontal direction. Human legs are too long, and the hip, knee and ankle joints don't have as much range of motion to move forward as efficiently as a cheetah can. Still, even some of the most determined athletes will never rise to the top ranks of elite runners because genetics plays a big role. Some people have a large number of fast-twitch muscle fibers that are ideal for sprinting but are a deterrent for distance running. Others have much more slow-twitch muscle fibers that are key in long-distance running but useless for sprinting. Fast-twitch muscle fibers work anaerobically, meaning they use glucose instead of oxygen to make energy. Fast-twitch fibers are able to generate bursts of speed, but they tire easily. Slow-twitch muscle fibers convert oxygen into fuel. They work much more slowly than fast-twitch muscles and are designed for continuous muscle contractions over long periods of time. Some runners have more genetic luck than others. Those with long legs tend to be faster because they can reach a longer stride length and those with larger lungs can generate more efficient oxygen flow. A runner's bone-to-muscle weight ratio also influences speed and endurance. For long-distance races, Baggish said, some people are simply better equipped genetically to handle more miles. They tend to have hardier musculoskeletal systems and cardiac systems, he added. But even those with bodies built for running have a mileage limit. "Everyone has a breaking point," Baggish said. It's possible for runners to reach a point where they start inflicting damage to their heart, but most athletes will not have this type of reaction, Baggish said. Heart damage can occur when runners go overboard with their training, such as when pushing through an illness or piling on the miles when they already have some kind of pre-existing heart condition. How are we still getting faster? Despite all of these limitations, "humans keep getting faster and faster," Weyand said. "So the obvious question is, why?" Some athletes have turned to illicit substances to boost their speeds. Sprinters have been known to turn to steroids to increase the force their quick strides can apply to the ground. Some marathoners engage in unlawful "blood doping" to boost their VO2 max. Blood doping involves boosting the number of red blood cells in an athlete's bloodstream, which can increase a person's VO2 max by around 10 percent, according to Weyand. This can be done by taking drugs or by transfusing an athlete's own blood, freezing it for a few months and then reinjecting the blood before a race to pump the bloodstream with extra red blood cells. Technology and equipment, such as better shoes and man-made running tracks, have helped sprinters improve their times, but in the last 20 years, there hasn't been any major technological development in this area, Morin said. Researchers have yet to find a really effective tech intervention for endurance races. "It's really a muscular and technical challenge now," Morin said. Records are dropping faster than ever, but most only fall by a few seconds or fractions of a second. Morin said he doesn't think the 2-hour marathon record will fall for another 20 to 30 years, if things continue the way they have been. But it's tough to predict when records will fall, because every once in a while, there is an outlier. The right combination of genes, environment and talent in an athlete can lead to a sudden and dramatic new record. A good example is the women's marathon record, Weyand said. While the men's marathon record has dropped five times in the last decade, each time by only a few seconds, British runner Paula Radcliffe's marathon record has stood for 11 years. "She just put the mark way out there," Weyand said. And it could happen again. Scientists can't pinpoint an exact time or pace that is physically impossible for humans to reach. It's a question that science hasn't answered -- and that may not be a bad thing, Morin said. After all, the answer could rob athletes of the inspiration and motivation to improve. "As a scientist, it's a question I don't want to answer for me, coaches or athletes," Morin said.